​Many throat cancer patients for whatever reason are left with swallowing issues; this page contains links to information and videos that have been recommended by members of our Facebook page. Member comments are shown as quotes. "The effects of cancer treatment on your swallowing ability: What to monitor during and after cancer treatment" (download this 1-page document by clicking on file to the left). This website was developed to enhance the education and knowledge of the patients and their families under the care of the SLP staff at Texas Health Care, PLLC. ​​Throughout this site, you will find information, illustrations, videos, etc. regarding the various medical/rehabilitative topics treated by the Speech Pathology Department. This site should serve as a practical reference for general information as well as provide answers to frequently asked questions. You can also view images of our staff in practice, hear personal accounts from current/former patients and find the latest information on current practices employed by our staff. You will also find links to contact this office with questions and/or appointment requests. The National Foundation of Swallowing Disorders strives to provide education to patients and caregivers impacted by a swallowing disorder in addition to the wide range of professionals who support our challenged community. We offer educational opportunities through our Dysphagia Webinar Series, our Dysphagia documentary, university outreach programs, and more. Dysphagia - Difficulty eating and swallowing food—dysphagia—can have a significant impact on a patient’s life after radiation treatment and surgery. Consuming enough nutrition is critical to a your ability to recover from surgery and tolerate life saving treatments. Recognizing this disorder early allows you and your doctor to implement an effective treatment plan. In the long term, patients may experience some permanent eating and swallowing disability as a result of treatment, but in many cases this can be treated or compensated for. ​US News & World Report Article: A Disorder That's Hard to Swallow - Dysphagia can cripple your quality of life and lead to other (deadly) conditions. Endoscopic spray cryotherapy: a new technique for mucosal ablation in the esophagus. Pharyngo-cutaneous fistula development is a major complication associated with Laryngo-pharyngectomy. Most cases respond well to conservative treatment. In recurrent and chronic non-healing fistulas, the constant bathing by saliva of the altered tissue is a prime factor in retarding the progress of healing. Prevention of wound contamination with saliva is necessary. The Montgomery salivary bypass tube (MSBT, Photo 1) directs saliva into the distal esophagus and thus this procedure supports spontaneous closure of the fistula. We describe our experience with MSBT in a case of recurrent Pharygo-cutaneous fistula. RESOURCE® THICKENUP® CLEAR improves swallowing safety compared to thin liquids*, does not over-thicken with time, and mixes easily in a wide range of foods and beverages. 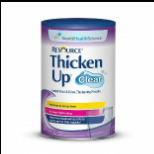 This instant thickener is tasteless, odorless, lump-free, and remains clear when mixed in water. Phagophobia is a word that comes from Greek phagein, “eat” and phobos, “fear”. It is a fear of swallowing that manifests in various symptoms without any apparent physical reason detectable by a traditional assessment. The disorder can wreak havoc on normal eating in a variety of ways. Patients may avoid certain types of food or textures, hyper-masticate (over-chew) their food, complain of food sticking, exhibit difficulty getting the swallow “started” and lose weight. All of these symptoms can create elevated levels of anxiety and cause patients to socially isolate themselves during mealtimes.